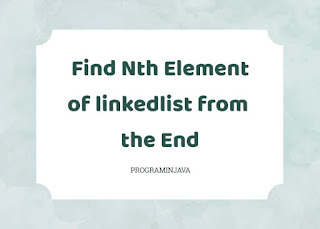 Data structure is one of the most asked interview topic for java developer interviews and believe me linked list is one of the most favorite area of data structure , there are so many other interview questions for linked list and one of them we will discuss today in this post. 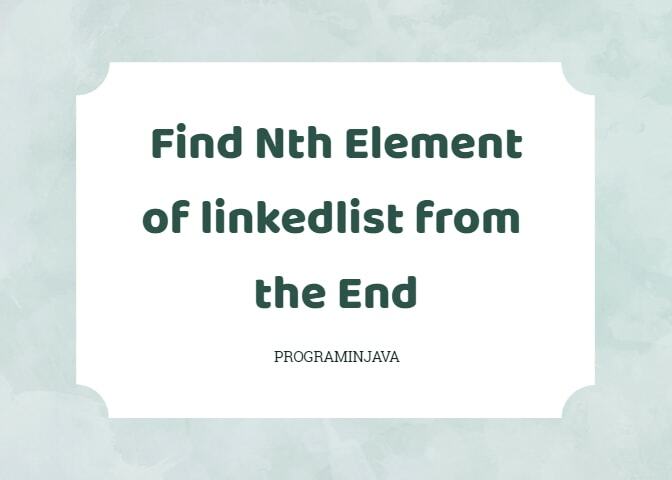 Objective - To Find the Nth Element of a Given Singly Linked list from the End. First we will see the Psuedo code (simple logic of solving the problem ) and then will look for the java implementation. We then move the right pointer to n(where n is the count of the number from the end ) times toward the right side. Now we will start moving both the pointer to the right side one by one till right pointer reaches to the last element keping the left pointer fixed. At this point the Element left pointer pointing is the required element. // nthFromLast(head, 1) should return 1. // nthFromLast(head, 5) should return 5. // nthFromLast(head2, 2) should return 3. // nthFromLast(head2, 4) should return 1. // nthFromLast(head2, 5) should return null. // nthFromLast(null, 1) should return null. // Implement your function below. // First, make sure that we have at least n items in the linked list. //  NOTE: Feel free to use the following function for testing. //  It converts the given linked list into an easy-to-read string format. If you like this article do share with your friends and colleagues. and if have any query leave us a comment.